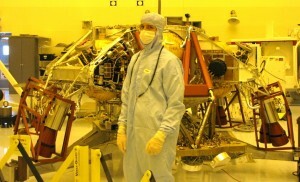 Roger Eckart with Curiosity’s aeroshell. MARS – Curiosity now sits at the bottom of Gale Crater in the southern hemisphere of our red neighbor, Mars. After a successful landing Sunday night Earth/California time, it is slowly beginning its mission of one Martian Sol duration, approximately two Earth years. 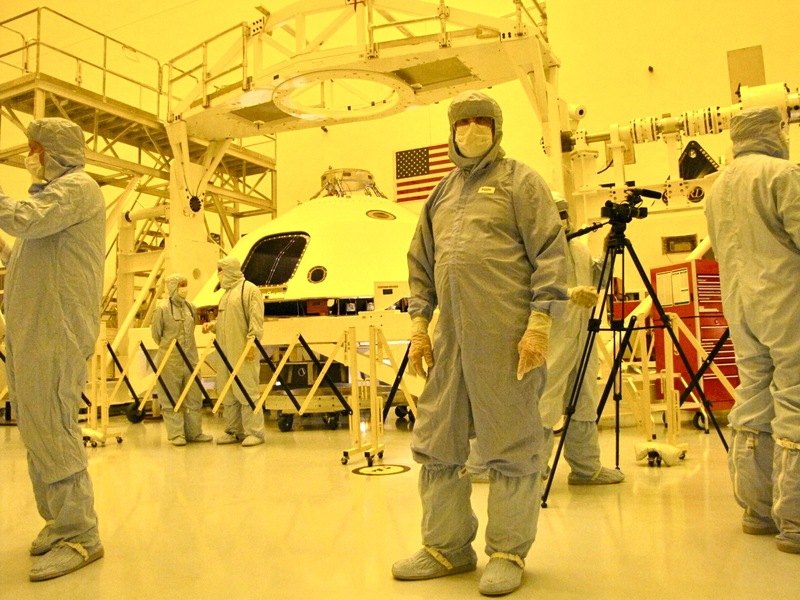 Last August I was privileged to participate in a “clean room” media opportunity with Curiosity, aptly named by the young Clara Ma four years ago. At the time she was a sixth grader living in Kansas. Yeah, that Kansas, Toto! Space enthusiasts in Kansas, go figure. 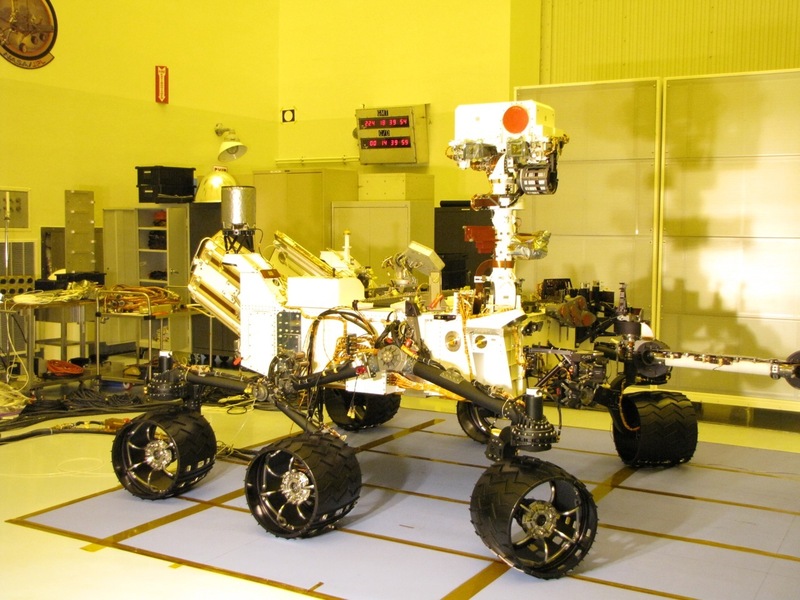 Curiosity, at that time, sat over in the corner of the PHSF (Payload Hazardous Servicing Facility) at KSC (Kennedy Space Center) awaiting its successful November launch. Klaxons rang above 25 or so reporters, warning of impending lightning activity moving across the Cape. Silently gleaming in various shades of gold and silver, glistening white, very complicated hardware, plumbed to the max, six wheels, it sat behind a California vanity license plate jokingly emblazoned Curiosity. American flag prominent on the wall. Curiosity, the rover, the descent aeroshell, and the, I’ll admit, a little sinister-looking, descent stage, the “sky crane” were all on display. Blue-suited figures were everywhere. This was the “clean room” after all. A technician with the sky crane. A young technician, indistinguishable from all the rest due to the clean room “bunny suits” admitted to me that at times his job included the drudgery that we all feel occasionally at our jobs. With a twinkle in his eyes (all I could see from within his blue suit) he did admit that the high point of the team’s long journey for him continued to be sharing the MSL (Mars Science Laboratory) with the public. To answer our questions, to present their “baby” to the public, you could hear his pride in this complicated expensive piece of space hardware about to finally embark on its mission. NASA, KSC and JPL personnel top to bottom; launch director, to astronaut, to volunteer manning the busses, this is the common impression. They are all so dedicated, so invested, so proud of the endeavor they are involved in. Mankind in space, mankind seeking greater knowledge of the larger environment that we inhabit. This entry was posted on Tuesday, August 7th, 2012 at 11:08 am	and is filed under News, Technology. You can follow any responses to this entry through the RSS 2.0 feed.